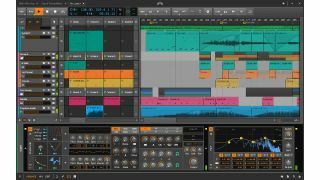 Bitwig Studio has been steadily attracting new users since its launch three years ago, and with it being so new, there are no doubt plenty of undiscovered techniques and workflows to come. Here, though, are six that every Bitwigger should know right now. For more pro DAW tutorials and guides, check out the December 2016 edition of Future Music. Did you know that Bitwig Studio allows you to pitchbend individual notes within chords by up to two octaves? When editing MIDI data in the Detail Editor Panel (aka piano roll), head to its top left and toggle the Micro-pitch toggle button. Now the centre line within a note represents default (ie, 0 semitones) - click to create automation-like breakpoints and draw in pitchbend curves. Hold Shift as you drag curves to lock them to semitone values. You can now bend pitch polyphonically (eg, individual notes within a chord), or add precise vibrato to only certain notes of a riff. The rather major caveat, however, is that this only works with Bitwig's own instruments, not third-party ones. Bitwig Studio's Cue Markers are small flags that you place at the top of the arrangement window to mark out sections of your song structure, just like Ableton Live's Locators. Go to View>Show Cue Markers to expose the top area above the timeline, then right-click there to insert a new cue marker. These can be renamed, copied, pasted and muted. Bitwig Studio's Mod devices enable you to funnel audio or MIDI signals from anywhere in a session and use them to modulate something else. For example, imagine you have a session set up with a MIDI arpeggiator on one track and a sustained synth pad on an audio channel. Load the Note Mod device on the pad channel, select the arpeggiator channel as the modulator, then add a Ladder filter within the Note Mod's FX Chain and use it to modulate the Cutoff. Now, by tweaking the Note Mod's envelope parameters, you can define how the incoming MIDI from the arp channel will trigger the Ladder filter's sweeps. Bitwig Studio comes bundled with an awesome drum replacement tool, Replacer, which in Bitwig's words "analyses the level of the incoming audio and generates notes at a single pitch, which are sent to a nested device chain". As well as being great for straight-up drum replacement, it's a handy tool for bolstering or layering individual hits within a loop in parallel. To do this, add an Effect Track set to 100% Wet and drag an E-Snare instrument into its INST slot. Send your drum loop to this track in parallel, then tweak the Replacer's Freq and Threshold parameters to ensure that only the loop's snare triggers the E-Snare. When working with multiple instruments within an Instrument Layer, you'll often want to apply the same Macro assignments and mod amounts to the same parameter across them. To do this in Ableton Live, you need to use the Options.txt workaround, but in Bitwig it's easy to do straight out the box: simply right-click the parameter, select Copy Modulation to all Layers, and that same parameter across all the layers will be assigned to the same Macro. In most DAWs, processing the mid and side components of a signal independently requires dedicated third-party plugins or some sort of fiddly routing - but not in Bitwig Studio! Simply load the Mid-Side Split Container on a channel, then load your choice of effects in the Mid and Side slots. You can now design your own custom effects chains for both the mono and stereo elements of a signal.